When Roberto (ITA) invited me to come to Italy to train with him for the Kingston worlds, I jumped at the chance. I've never made it to a Euromaster event and I found the depth of the field very impressive. There were 70 full-rig sailors from 8 countries with an especially strong team from Spain. Barcelona has a great master's sailing program that included Miguel Noguer and José-Luis Doreste (both Olympic gold medalists) and a very fast Leandro Rosado. All of them came to compete. Lake Como is interesting because the cold wind from the Alps to the north tries to dominate the prevailing wind from the southwest. The wind can switch from north to south and back again several times a day. 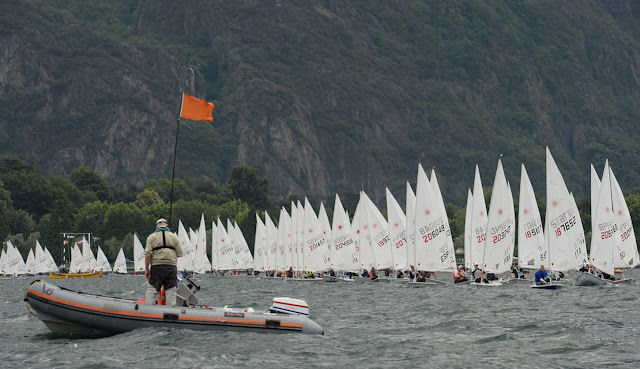 There were some tricky shifts at windward marks and it was easy to lose 20 places as I did in one race with a 35º header coming into the mark. This put me back into the 50's, while another shift put me back into the 20's. It was impressive to see how consistent the the top sailors were. The European masters is a little different because they use your birth year instead of your birth date. Because I turn 65 in November (after Kingston) I was sailing for the first time as a Great Grand Master. On Friday, the conditions did not cooperate and we did not complete any races. The first video is from my hat-cam in the third race on Saturday. It's a Sail Pro which takes great HD videos but the sound is muffled. You'll see that this has its advantages. This was my best race on Saturday, and learning was more important than not finishing. 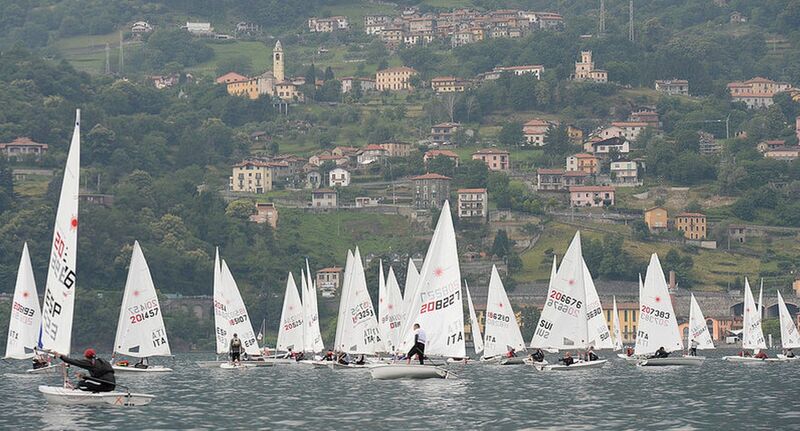 The wind died with Alessandro Castelli (ITA) leading nicely, and the race was again abandoned. It's good that my camera does not record sounds well because there was a lot of yelling at the start in Italian, French, German, and Spanish (you can hear some of it if you crank up the volume). People later asked if I had learned any new sailing terms and I said yes, but I'm not sure in what language. The weather did not cooperate on Sunday and no more races were completed, but I got just what I needed for Kingston - a list of things to work on. Leandro Rosado (ESP) won with with José-Luis Doreste (ESP) right behind. They are awesome sailors, and there were many other excellent sailors who were better at pointing upwind and playing the shifts in wind lanes. With only three races completed, I was unable to drop my 23rd and ended in 11th place overall. You can see the results here starting on page 9. I was one of 3 GGMs competing in the full rig so I came home with my first win as a GGM. It was a superb location with a lot of talent. I am grateful to Christine and Roberto for being such gracious hosts and to all of their friends, as well as all of the excellent sailors who helped make this trip to Italy so awesome. Pam and I will definitely be back. Do you prefer the SailPro camera to the GoPro? What do you see as the advantages of each? My main issue was getting under the boom when the vang is cranked in. The GoPro might take better pictures but I've never used one because the SailPro has a lower profile. A major benefit is that people are much better behaved when they know they're being videoed. It's actually quite amazing. LOL. Maybe I will make a "dummy" camera and mount it on my cap and see if that makes my fellow sailors behave better! Funny that you mention that. I've worn my hat cam with no battery or memory card and, sure enough, some of the more aggressive local sailors were very well-behaved. As Pam likes to say, sunlight is the best disinfectant. Excellent post - the videos with commentaries are great. A coaching series in the works? Thanks. What topics would interest you? Nothing much - the only things I need serious help on are just starts, upwind, downwind, reaching, tactics, strategy, and boat speed. Everything on KR's list plus finishing. Oh, and also mental fitness and physical fitness. And how to optimize the rigging on the Laser and what's the best get to wear. Apart from all that I'm in pretty good shape. This is actually a good idea because our posts tend to be fairly random. We need a way to organize current and future posts in the order you'd have in a race. We'll work on this. This is great. Thanks for posting these videos. I feel like I'm right there in the mix. Question: It's hard to judge from videos but the wind looks quite light at least in the first race. I notice that you have some cunningham on and wonder if that may have contributed to your pointing issues? For me, the cunningham control is just to keep the wrinkles out unless it's really honking. In the second video, you'll see black tape above the mast joint because we found a slight tear. To protect it, I used less cunningham than normal that day. Pointing was a problem for the entire series, which is unusual for me. After the racing, one person told me that my sail looked like the oldest in the fleet. I did not mind this because I was there to practice and learn, and you learn more in the middle than at the front or back. But I sure hope that a new sail for Kingston helps my pointing. The competition in the GMs will be tough as there will be at least 2 who have won a worlds and at least 4 who have been runners up. As always, getting a top 5 finish will be tough! Really nicely managed starts. I liked in the second one when you push more to the pin. You had a great line site, that enabled you to reach over the top with confidence. In the first, you pulled together so many elements to get a great start -- and you seemed relaxed throughout. Great to watch. Thanks, I appreciate that. The interesting thing about a hat-cam is you get to see what I saw. Believe me, not all of my starts were this good! You're more than welcome. It's a great place to sail. I was an honorary member by learning how to cook pasta properly. The sail and boat were loaned by my hosts who were so gracious. And no one asked me about my clothing either.